Although technically classed as an apartment the property is distributed over two floors and benefits both substantial indoor and outdoor living space. The lower level of the property comprises entrance hall with storage cupboard; fully fitted kitchen including Zanussi white goods; bright living-dining room with double aspect and patio doors to the terrace that has excellent rural and mountain views; master bedroom with built in wardrobes and en suite bathroom with bath & shower over, toilet, bidet and basin; second double bedroom with built in wardrobes; and second bathroom with shower, toilet and basin. A staircase from the living room leads to the upper level and room that is currently utilised as a third bedroom but could be equally effective as a second living room/dining room, office or similar. Accessed from either of two doors on the upper floor there is a “U” shaped solarium that wraps around three sides of the first floor room. The largest part of the solarium has sufficient room for both dining table and chairs and sun loungers, whilst the smaller area has been designated as a lounge with sofa and chairs from which to enjoy the mountain views and Sierra Cabrera. The property is very well equipped for full time living as it has air conditioning for the summer and gas powered central heating for the winter. Also included in the sale is a larger than average underground parking space of 23m². The development has well maintained gardens and a swimming pool and is only a 10 minute walk from the village of Los Gallardos. In the village you will find numerous bars and restaurants, banks, supermarkets, chemist, schools, church and weekly Tuesday market. A traditional Spanish village is not complete without its annual fiesta which in Los Gallardos takes place in July. Other fiestas take place through the year including Three Kings in January for which people come from miles around. 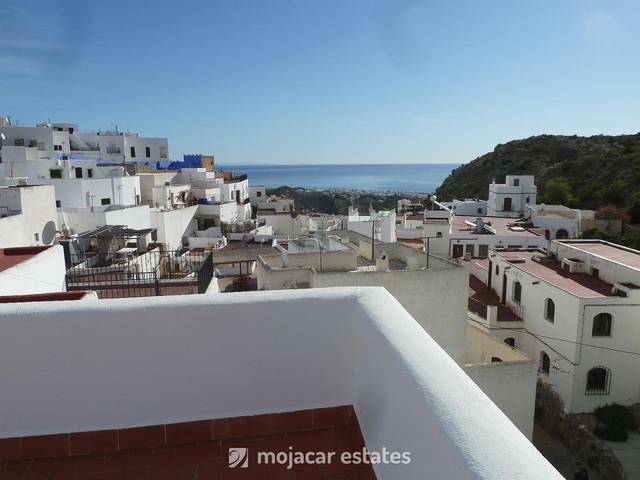 The nearest beaches are Mojácar and Garrucha and are a 10 minute drive away. For golfers there are several courses in the area including, Valle del Este also a 10 minute drive away and then Mojácar Playa, Macenas and Desert Springs are all within a half-an-hour drive. Motorway access is close making airport transfers to Almería, Murcia and Alicante relatively quick and easy with 45, 80 and 120 minutes travelling time respectively. Huerta Nueva is a great location for either full time living or as a holiday location. As a full time resident you will not experience the ghost town scenario that happens in some areas in the winter months and as a holiday resident you will be able to enjoy your stay in more peaceful surroundings than the beach front resorts.